WHAT ELSE CAN I EXPECT FROM AN ONLINE MASTER'S IN ORGANIZATIONAL MANAGEMENT PROGRAM? The field of organizational management is primarily concerned with coordinating, planning and leading the various departments and divisions that make up a company or organization. In addition to meeting sales and productivity objectives, organizational managers also work to cut unnecessary expenses, maximize efficiency, boost employee morale and otherwise ensure that operations run smoothly and successfully on a day-to-day basis. This holistic approach to management enables executives to take a close look at their workforce to determine their organization's key strengths and assets, as well as areas of potential improvement. A master's degree in organizational management will prepare students to enact meaningful changes in today's workplaces. The master's curriculum is designed to build on the foundational knowledge and skills of undergraduate studies while also introducing more advanced theories and approaches to modern business. Many organizational management master's programs culminate in a capstone experience course, which allows students to use what they have learned to address real-world business problems. Many of these programs also require students to take part in on-site internships, where they can receive supervised training from experienced professionals. Many of today's students are choosing to earn their master's in organizational management online, instead of in a classroom. Web-based students adhere to the same rigorous curriculum as their brick-and-mortar counterparts, leading to the same number of job opportunities after graduation. The asynchronous (or self-paced) format of most online organizational management programs is also ideal for students with commitments that may interfere with campus-based learning, such as childcare or part-time employment. Learn more about what you can do with an online master's in organizational management and what kind of career opportunities you can look forward to with this comprehensive guide. WILL AN ONLINE MASTER'S IN ORGANIZATIONAL MANAGEMENT PROGRAM PROVIDE ME WITH THE SKILLS I NEED TO ADVANCE MY CAREER? A master's in organizational management is designed for students who wish to advance their careers. The curriculum offers a blend of organizational psychology, traditional management and contemporary business strategy. The coursework will cover topics like organizational behavior and psychology, supply chain logistics, management analysis, finance, project management and human resources. Some master's programs allow students to focus on niche areas of organizational management; common degree 'specializations' in this field include global management, human resources management, organizational leadership and supply chain management. Students who follow specialized tracks are particularly well-positioned to compete for top positions in the job market. WILL AN ONLINE MASTER'S IN ORGANIZATIONAL MANAGEMENT PROGRAM WORK WITH MY SCHEDULE? Online master's in management degree programs offer a flexible, easily accessible alternative to traditional higher learning. Students are able to download course lectures and readings, participate in virtual discussions with other students, submit written assignments, take exams and communicate with their professors ― all from their desktop computer. Current technology also allows them to study away from home using a laptop, tablet, smartphone and other Wi-Fi-compatible devices. For added convenience, online management master's students can often coordinate internship opportunities at sites that are reasonably close to their current residence. WHAT JOBS CAN I GET WITH MY MASTER'S IN ORGANIZATIONAL MANAGEMENT? Organizational management is employed throughout the business world, so master's degree recipients in this field may pursue wide range of professional roles. Most will enter the corporate sector and take on management jobs in human resources, information technology, supply chain logistics or sales and marketing. The burgeoning 'project management' career path is also quite popular with today's master's graduates. Additionally, those with an organizational management degree may find work in nonprofit organizations, government agencies, healthcare facilities or higher learning institutions. 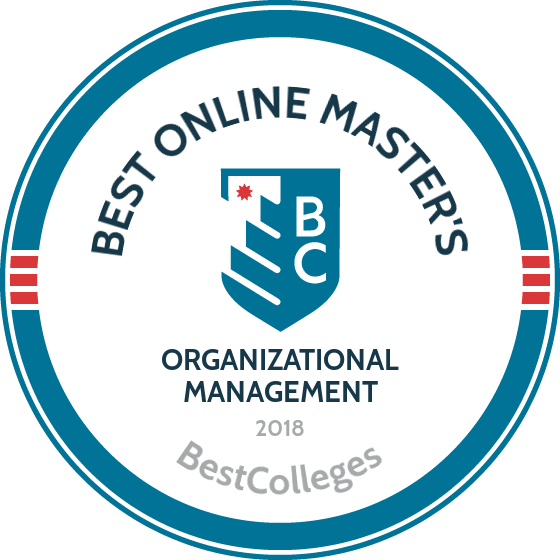 WHAT ARE THE BEST ONLINE MASTER'S IN ORGANIZATIONAL MANAGEMENT PROGRAMS? Choosing a program is an incredibly personal decision, and only you can properly evaluate whether a target school's strengths match your educational needs. The following ranked list of schools should serve as a helpful starting point in your search for the best online master's in organizational management programs in the United States. Our ranking is based on the courses schools offer, available specializations, student outcomes, career support services, and other criteria used to determine academic excellence. If you are considering an online master's in organizational management, be sure to contact admissions specialists at different colleges and universities to learn more their about specific requirements and offerings. Through distance learning, Johns Hopkins delivers a 36-credit master's of science in organizational leadership degree that boasts the same curriculum as the university's on-campus program. Built with collaboration in mind, the program's content emphasizes principles of leadership, management, and public sector administration best practices. To be eligible for admission, applicants must have a bachelor's degree and must be currently employed in a relevant field, such as corrections, public health, or law enforcement. Johns Hopkins' online master's in organizational management degree, which students typically complete within two years, is designed for working professionals and those with demanding schedules. The university offers courses completely online through an easily navigated course management system, and provides various tools to help students keep track of their assignments. To graduate, students must complete a capstone course that includes individual, group, and class projects. All distance learners at Johns Hopkins pay the same tuition, regardless of their state of residence. Ideal for professionals working in the nonprofit sector, Gratz's master's of science in nonprofit management degree ensures that students develop key skills in organizational management. This practitioner-oriented program, which can be completed entirely online, emphasizes leadership abilities and helps students discover methods for solving real-world problems relevant to managing nonprofit organizations. Students in Gratz's organizational management master's degree online program choose from a range of available courses, including organizational behavior, nonprofit law, and fundraising. The college offers courses for distance learners in an accelerated format, with each course lasting eight weeks. On average, students earn their master's of science in nonprofit management within two years. All distance learners at Gratz pay the same tuition rates. The college provides students with access to financial aid, and features more than a dozen fellowships available to administrators working in Jewish organizations. Applicants must provide a resume, all undergraduate and graduate transcripts, a personal statement, and two letters of recommendation with their online application. A private, Jesuit institution, Gonzaga provides higher education to nearly 8,000 students annually through more than 75 different academic programs. For students seeking an organizational management master's degree online, Gonzaga offers a master's of arts in organizational leadership that emphasizes skills in leadership, management, and communication. This 30-credit program features two different concentrations: a four-course service leader track, and a hybrid global leader track that includes one- to two-week immersions designed to give students exposure to working at culturally diverse, international, nonprofit institutions. After typically earning their degree within two years, graduates leave the program well-equipped to take the helm and thrive in a professional management role. To apply, prospective students must submit a college transcript, recommendation letters, and a statement of purpose. Applicants with a college GPA of at least 3.0 are not required to submit an MAT or GRE score. Graduates of UWF's master's of science in administration program are prepared to pursue leadership-oriented careers in areas like fiscal management, human resources management, and nonprofit management. The program features four available concentrations: acquisition and contract administration, human performance technology, leadership, and public administration. This master's in organizational management boasts rigorous academic requirements; applicants must submit GRE, MAT, or GRE scores in the upper 50th percentile along with three letters of recommendation before the university's admissions committee will conduct a holistic review of their credentials. For nontraditional students, UWF delivers distance learning programs that include more than 600 online courses offered every semester. Students in the master's of administration program can complete their degree entirely online through instruction from faculty with real-world experience. Distance learners can earn their degree in as few as four semesters, but must complete 12 required core curriculum credits. Through its distance learning programs, CMU delivers challenging online courses, featuring instruction from renowned faculty, in eight-, 12-, and 16-week formats. The university boasts flexible admission requirements for its online graduate programs; applicants must have a minimum undergraduate GPA of 2.7 but those with lower grades may be accepted on a conditional basis. CMU's master's of science in administration program, open to both part-time and full-time students, is ideal for those who want to advance professionally in administrative careers. With various concentrations available, including leadership and project management, this program begins each summer term with its application deadline at the beginning of May. Students must complete around 36 credits to graduate with their organizational management master's degree online, including an administrative core and courses in their chosen area of emphasis. Some concentrations also require students to complete a final project, wherein they research organizational issues and synthesize course content. Additionally, CMU allows students to earn credit for prior learning such as professional work, training, and life experiences. Located in Irvine, California, Brandman has provided higher education to students since 1958 and now features distance learning programs. For students seeking to earn a master's of organizational management degree online, the university delivers a 36-credit master's of arts degree in organizational leadership. Designed for midcareer professionals, the program focuses on six learning outcomes: leadership, critical analysis, ethics, systems, collaboration, and change (including change management strategies). Core courses include organizational research, leadership and team development, and leading organizational change. Students can tailor their learning experience by choosing 12 credits of electives, with the help of an academic advisor, in disciplines such as education, computer science, and health systems administration. Additionally, students must complete a three-credit capstone seminar to graduate with their degree. Graduates leave Brandman's organizational management master's program prepared to serve as innovative leaders in a range of organizations. A military college with options available for civilian students, Norwich is the birthplace of the Reserve Officers' Training Corps. Offering classes both online and on campus, the university delivers an education rooted in confidence, loyalty, and honor. Distance learners benefit from small class sizes and participate in discussions with classmates and faculty on a weekly basis. Because Norwich students take classes one at a time, a busy learner can still earn a master's degree in organizational management at a pace that fits their schedule. Norwich's master's of science degree in leadership allows students to choose among four specialties: leading change management consulting, human resources leadership, public sector/government/military leadership, and organizational leadership. Students can complete their online master's in leadership in as little as 18 months. Graduates leave Norwich prepared to work in diverse organizations and bridge cultural and generational differences as effective managers. Located in Nashville, Tennessee, TNU provides a high quality, Christ-based education that allows students to thrive academically while staying true to their religious convictions. While the university serves more than 1,000 students on its campus, distance learners and nontraditional students can pursue undergraduate and graduate degrees, including an organizational management master's degree, in an online-only format. TNU's 33-credit master's of organizational leadership degree is an interdisciplinary program that merges principles of communication, religion, and business to help graduates excel as strategic thinkers and innovative problem-solvers. The program focuses on three levels of leadership -- personal leadership development, interpersonal/group leadership, and organizational impact -- and reinforces central concepts through a range of required coursework. Students can choose among classes like strategic thinking, organizational culture and change, and strategic planning for servant leaders. Typically, distance learners earn their degree in about 18 months. Distance learners working toward a master's in organizational management at LCU can take one class at a time and usually complete the program within 21 months. The degree, which is available entirely online, is perfect for busy learners seeking an education that's both grounded in Christian principles and able to offer the flexibility they need. At its core, LCU's master's of arts in organizational leadership program helps to develop students into effective leaders and strategic thinkers, stewarded by professors who are leaders in their respective fields. The program's coursework is diverse and engaging, teaching learners critical skills they need to succeed as management professionals, while focusing on key leadership theories, biblical servant-leadership models, and team-building consensus development techniques. Sample courses in the program include interpersonal leadership for organizational effectiveness and dynamics of change and conflict. To ensure that its academic programs remain accessible, LCU provides students access to financial aid like the President’s Scholarship and Dean’s Scholarship. Students looking to earn an organizational management master's degree online should consider NU's master's of science in leadership program. Available 100% online, the curriculum combines real-world activities with an "action learning" approach. Because NU boasts partnerships around the world, students hoping to succeed as global leaders find the university's leadership programs well-suited to their needs. Designed for professionals seeking career advancement, NU's master's of science in leadership program requires applicants to submit a statement of purpose, a resume, two letters of recommendation, undergraduate degree documentation, and a transcript. Students must complete several required courses, and may subsequently choose to concentrate in any one of several areas: health management, human resources, leading & managing technical projects, nonprofit management, organizational communications, project management, or sport and social change. Depending on their chosen concentration, students must complete 45 or 46 quarter credits to earn their degree. For distance learners and nontraditional students, NPU's master's of organizational leadership degree is a standout among online master's of organizational management programs. The 36-credit program is comprised of 13 core courses and five electives, all modeled on an industry-driven curriculum that helps students develop essential leadership skills. Coursework covers topics such as change leadership, social responsibility, nonprofit management, and strategic planning. One appealing feature of NPU's master's in leadership program is its flexibility. Students can complete all the required coursework on campus, at either the Grayslake or Chicago location, but can also choose to either take all courses online or complete the program in a hybrid format. NPU's online classes are taught asynchronously -- meaning there's no set class times -- so students can complete work on their schedule. To ensure that program graduates maintain their acquired competencies, the university offers a 50% tuition discount for all alumni who enroll in business and nonprofit courses. DU delivers its master's of science in leadership and organizations degree, with a concentration in organizational development, in a 100% online format. Ideal for students who want to serve as a resource for organizations by helping to improve organizational culture, the 48-credit program introduces learners to topics like the philosophy of organizational change, organizational development evaluation and intervention strategies, and different models of organizational development change. In addition to completing a final capstone course or seminar, students can choose concentration courses, such as organizational culture and organizational development impacts or team interventions. Students applying to DU's master's of science in leadership and organizations program must submit a statement of purpose, a resume, and supplemental materials; the program does not require students to submit GMAT or GRE scores. To be eligible for admission, students must have a bachelor's degree and a minimum 2.5 undergraduate GPA. Online courses at Baker are designed to benefit working professionals and active-duty members of the military who want to develop academically without committing to a full-time, on-campus program. Using the Moodle learning management system, online students at Baker can manage their assignments and interact with classmates in a 100% online environment. Baker also provides distance learners with access to resources, such as a help desk and academic advisors, to ensure they have the help they need to succeed both academically and professionally. Baker is an excellent fit for students who want to earn an organizational management master's degree. The university's 39-credit master's of arts in organizational leadership degree, available entirely online, helps students develop leadership skills while gaining understanding of concepts needed to work in the field, like ethical business practices, group problem-solving, conflict resolution, and negotiation. Beyond core courses, students can select among three concentrations: finance, health care administration, and human resources. Each concentration requires students to complete four courses with a grade of "B" or better. Regis delivers an online master's of science in organizational leadership degree that gives students an in-depth understanding of top management practices today. Through courses like leading in a new era, business intelligence and analytics, and strategic HR management, students develop the ethical, knowledge-based foundation necessary for effective leadership. To keep the 30-credit program accessible, Regis offers start dates for the program's eight-week terms in January and May. Distance learners at Regis pay the same tuition rate regardless of their state of residence. Students that enroll in Regis' master's in leadership program can take classes either on campus or online in an asynchronous format. Admission requirements for the program include a resume, an essay, and a minimum 3.0 GPA. With career counseling available, graduates progress to successful careers in human resources, social and community services, and administrative services, among other fields. Saint Mary's helps students unlock their potential and advance their careers through both distance learning and traditional, on-campus programs. Students in St. Mary's master's of arts in organizational leadership program benefit from a faculty comprised of academics and real-world practitioners who impart skills in strategic planning, coaching and leadership techniques, and innovative thinking suited to the workplace. Graduates of the program, an excellent choice for students seeking an organizational management master's degree online, leave capable of serving as ethical leaders fluent in essential technologies. St. Mary's organizational leadership master's program features a rigorous curriculum in a 36-credit, 20-month online format. The university does not allow students in the program to transfer any previously earned credits toward their degree. To be eligible, applicants must have an undergraduate degree and a minimum 2.75 GPA. For students in the military, St. Mary's waives the application fee and defers tuition billing. Rooted in the Lutheran tradition, Concordia-Chicago provides accessible learning opportunities in the arts, sciences, business, and education. The university delivers degree and certificate programs in both on-campus and online formats. For students seeking an organizational management master's degree online, Concordia-Chicago's master of arts in leadership studies program is among the best available in a 100% online format. The curriculum of Concordia-Chicago's master of arts in leadership studies program is well-suited to students who want to excel in a dynamic, fast-paced global economy. Learners are exposed to core courses including leadership and excellence, strategic leadership and planning, ethical and social leadership, and introduction to research. By developing a strong understanding of leadership theory, and delving into specializations such as knowledge management, health services, servant leadership, higher education leadership, and organizational leadership, graduates leave the program prepared to thrive in both public and private sector careers and excel as project managers, sales directors, hospital administrators, and in other roles. Boasting a vibrant, urban campus located just three blocks from downtown Winston-Salem, North Carolina, Piedmont provides a quality educational experience in both a traditional, in-person setting and through distance learning. A recognized leader in Bible-centered education, Piedmont offers a range of degree programs, including a 100% online master's in organizational management degree. Piedmont's 36-credit, online master's of arts in leadership program is affordable, accessible, and challenging, and allows students to take advantage of real-world professional experience in a collegiate setting. Distance learners must complete 18 credits of leadership studies classes, 12 credits of electives, three research credits, and a three-credit leadership capstone project. Sample courses include organizational theory, and conflict and collaboration. Students typically earn their master's in leadership from Piedmont in just two years. Admission requirements include an undergraduate degree, a minimum GPA of 2.5, and two letters of reference. At Duquesne, students benefit from an education steeped in the moral and spiritual values of the Catholic faith, as well a 130 year-history of academic excellence. Regardless of status as on-campus pupils or distance learners, all Duquesne students have access to academic advisors, orientations, the writing center, and the university's Gumberg Library. Duquesne's 30-credit master's of science in leadership program includes a 15-credit leadership core, featuring classes like conflict resolution and organizational communication, along with 15 credits of electives that students must complete to graduate. Duquesne's organizational management master's degree is available entirely online, with start dates in January, May, and August. Graduates leave the program within two years, ready to enter the workforce with the skills needed to serve as critical thinkers, problem-solvers, and effective communicators. Currently, students from 11 states, including Washington and New Mexico, are not eligible for admission to Duquesne's online programs. Cleary's online master's of business administration in global leadership degree is a wise choice for students seeking a career in the increasingly global marketplace. The 33-credit, 22-month organizational management master's program provides learners with the foundational skills needed for effective administration, focusing on areas like critical thinking, ethical decision-making, and cross cultural communication best practices. IWU-Marion delivers an online master's of arts in organizational leadership degree that's perfect for nontraditional students who want to master the nuances of leadership theory and subsequently apply those concepts in a professional setting. Instructed by faculty who have advanced degrees and professional experience, students learn how to navigate the ethical and managerial dilemmas common in evaluating the needs of and best practices for complex organizations. IWU-Marion's online leadership degree is also an ideal choice for those who want to finish their education quickly, as students can complete the program in just under two years. To be eligible for this program, applicants must have a baccalaureate degree from an accredited program, have earned an undergraduate GPA of at least 3.0, and must currently be working in a leadership position. To graduate, students must complete the program's 36-credit course of study with a minimum 3.0 GPA. Graduates leave IWU-Marion's master's in organizational management program as highly competitive applicants in the job market. Founded in 1907, Olivet is located one hour south of Chicago in Bourbonnais, Illinois. Students enrolled in the university's 24-month, 35-credit master's of organizational leadership program are primarily working professionals who have already earned a bachelor's degree. As such, networking opportunities abound. Throughout the curriculum, learners in Olivet's organizational management master's degree online program learn to think and manage more effectively, mastering complex skills such as performance analysis, information processing and analysis, and decision-making rooted in situational analysis. Olivet's leadership program covers a variety of key concepts, like communication, mentoring, fiscal performance evaluation, and ethical leadership. Before they can graduate, distance learners get the opportunity to test their newly acquired skills by completing a global business experience research-based project. Additionally, students who want to explore the world at large can choose to participate in global immersion programs offered through Olivet's School of Graduate and Continuing Studies. WGU is a different kind of university in that it's a competency-based, nonprofit institution catering specifically to distance learners. Students who pursue their online master's of science in management and leadership degree from WGU leave the program prepared to work in fast-paced, dynamic, and diverse environments across sectors, at nonprofits, private corporations, and major government agencies. In the two-year, 34-credit program, students can create their own schedules and complete self-paced classes whenever they find it most convenient. With the help of faculty mentors, students at WGU create a personalized degree plan that caters to their personal academic goals. Additionally, distance learners enjoy access to learning resources as they complete coursework across key subject areas, like business acumen, human capital management, and strategic management. To graduate, students must fulfill a final capstone requirement wherein they research a real-world issue and apply learned concepts to propose a viable solution. Students looking to earn an online master's degree in organizational management should consider Amridge, located in Montgomery, Alabama. A Christian university committed to "spiritual vitality," Amridge delivers master's degrees in a traditional, on-campus format and through its distance learning programs. The school's master's of science in leadership and management program features a rigorous curriculum covering such essential skills as team-building, conflict resolution, organizational development, and productivity improvement. The program, focused on ethical and moral approaches, is specifically designed to provide students with real-world skills to help them thrive in the workforce. To graduate from the program, students must complete 40 credits of required courses with a minimum GPA of 2.0, pass a capstone course, and complete an exit examination. Amridge allows distance learners to transfer up to 15 previously earned credits toward their degree. For distance learners and nontraditional students who want to develop and refine their leadership skills, UW-Platteville's 100% online master's of science in organizational change leadership program is an excellent choice. A leader among organizational management master's programs available today, the program helps students learn how to apply leadership skills in a real-world setting. To this end, the curriculum is structured around skill development, including in areas like critical thinking and decision-making, conflict resolution, and problem-solving. For students seeking more specialized skills, UW-Platteville offers various areas of emphasis, like health care, project management, or human resources. Students with a strong professional background can earn credit toward their degree for previous professional experience. To be eligible for admission to the program, applicants must have an undergraduate GPA of or above 2.75; UW-Platteville also provides other entry methods, such as single-course enrollment and trial enrollment, where students who are not otherwise eligible are admitted based on the approval of the director of the School of Graduate Studies. Known for putting students first, NAU delivers undergraduate, graduate, and certificate programs at its Flagstaff, Arizona campus and through distance learning. The university features programs specifically designed for working professionals looking to advance their careers, including an online master’s degree in organizational management. NAU's master’s degree in administration with a leadership emphasis, offered 100% online, is ideal for students who aspire to be strong leaders and gain the skills needed to excel as managers or executives in various industries. In the 36-credit program, students complete 15 credits in core area classes, 18 in an emphasis area, and a three-credit capstone project, all while learning how to lead organizational change and solve problems effectively. To be eligible for the program, applicants must have a minimum undergraduate GPA of 3.0, provide undergraduate transcripts, submit recommendation letters, complete an essay, and provide a resume demonstrating at least five years of professional work experience. The job outlook is strong for master's degree recipients in today's business climate. The Bureau of Labor Statistics (BLS) projects that jobs in management will grow by 6% between 2014 and 2024; while this 10-year growth rate is below-average, this expected increase will result in more than 500,000 newly created jobs for management professionals. Unemployment rates are relatively low for corporate jobs, particularly management-related roles. The following table lists the current unemployment rates for some of the most popular careers for organizational management degree-holders. The average unemployment rate of all 10 occupations listed is 2.62%; comparatively, the national unemployment rate for all industries is currently set at 4.7%. Graduate students who earn master's degrees in management-oriented fields enjoy higher earning potential than other master's graduates. How does organizational management stack up against other master's degree fields in terms of salary expectations? The salary comparison chart below features expected earnings at two key career benchmarks. In addition to master's degree field of study, another important indicator of salary potential is the employee's specific job title. Other important factors include certification status, employer size and city/state of employment. The next table looks at 20-year salary growth expectations for five popular careers among organizational management grads. All five occupations listed reported a career salary growth rate of at least 23%. Organizational development consultants experienced the highest growth rate: a 46% increase in earnings between the entry-level and late-career stages. Operations managers placed second with 44.7% 20-year salary growth, followed by supply chain managers with 37.9% growth. Students who graduate with an master's in organizational management will be qualified for dozens of top-level positions, although individual eligibility will depend on the candidate's degree specializations and experience level. Four popular career choices for organizational management degree-holders are outlined below. Computer and Information Systems Managers: These employees (often called CIS managers or IT managers for short) oversee the tech-based day-to-day operations at companies and organizations. They are primarily responsible for coordinating computer and information systems objectives, and then developing and implementing tools and software programs that can be used to reach these goals. Human Resources Managers: Human resources (HR) managers supervise their organization's various administrative activities and projects. They often have a direct hand in the recruitment, screening and hiring of job candidates, as well as providing comprehensive orientation for new employees. They also handle tasks related to compensation and benefits, personnel surveys and workplace conflict mediation. Training and Development Managers: Training and development managers design courses and continuing education programs to help employees build skills, knowledge and competencies in certain areas. A background in organizational management will prepare these employees to properly assess the strengths and weaknesses of the personnel under their watch and deliver effective training and development modules. Top Executives: Top executives work at the forefront of modern business. They work with departmental managers and other top-level personnel to develop strategies and objectives for their organization. They also monitor and evaluate different teams to ensure these goals are carried out quickly and efficiently. Making professional connections and learning about different approaches to organizational management is crucial to your success. Professional organizations offer a great entry point for students who want to learn more about their chosen career path. Below you'll find three of the country's most prominent organizations established for organizational management professionals. These organizations host networking events, provide online trainings, maintain active job boards, and offer other services for career-ready college graduates. Resources like these often prove invaluable as you complete your degree requirements and prepare to enter the job market. Institute for Organization Management: The IOM is classified as the 'professional development program of the U.S. Chamber of Commerce Foundation'. The institute provides a four-year program for rising organization management professionals that consists of four-week courses. Course registration is available online. National Management Association: Headquartered in Ohio, this nonprofit organization currently maintains six regional U.S. chapters. The NMA is home to the certified manager (CM) credential, and members can also take part in professional development courses and contests. Society for Human Resource Management: Considered the world's largest HR-oriented professional organization, the SHRM boasts 285,000 members in 165 different countries. The website features a vast online resource library, as well as links to continuing education opportunities and an events calendar.